This article is about Samus's appearance in Super Smash Bros. Ultimate. For the character in other contexts, see Samus. Samus (サムス, Samus) is a playable character in Super Smash Bros. Ultimate. She retains her modified Metroid: Other M design from SSB4. Samus is classified as fighter #04. Samus has received a mixture of buffs and nerfs in the transition to Ultimate, but has been significantly buffed overall. She greatly benefits from the universal changes, most notably the reduced landing lag and weakening of shields, making her aerials safer to use for approaching. Her mobility has been improved, with her previously slow and punishable roll having been significantly increased in speed, making it more usable as an escape option. Her grab game has also been considerably strengthened, with her grabs having less ending lag relative to the rest of the cast, and all throws dealing more damage and knockback; in particular, her up throw is now her strongest throw and a viable KO option at high percents, while her down throw has increased combo potential due to its lower ending lag. Adding to this, her repertoire of projectiles has been further improved, as Bombs explode earlier on contact with enemies, Missiles deal more damage and have less ending lag, Super Missiles stall for a longer time before flying forward, and most notably, Charge Shot can be charged in the air and deals far greater damage, being able to break shields if used in conjunction with almost any other attack in her arsenal. This gives Samus more opportunities to charge up her most threatening move, and strengthens her zoning and punish game, evoking her very projectile-heavy fighting style in her home series. Lastly, her dash attack, down tilt and down smash all deal noticeably more knockback, improving her KO ability. With her heightened offensive power, Samus' playstyle now more closely veers towards a balanced "mighty glacier" similar to Link, with potent KO ability (particularly through her Charge Shot), below-average mobility, and generally well-rounded attributes. However, Samus has received some nerfs that, while fewer in comparison to her buffs, drastically affect her playstyle. The most notable is her dash attack, previously an excellent combo tool and often considered her best move, which has received higher ending lag and a more horizontal angle that prevent it from comboing, instead being repurposed into a KO move with much more situational use. Samus is also one of the characters hindered the most by the nerfs to rage, removing her ability to take off stocks at very early percents by setting up a Screw Attack with high rage, which was a commonly exploitable tactic in conjunction with her dash attack. Furthermore, her neutral attack, infamous for its inability to connect both hits at most percents, has been made even worse by the lower knockback on the first hit and its slower transition into the second hit, removing its most reliable setups at higher percents and rendering it nearly useless. Because of the nerfs to her more polarized offensive options, Samus now relies on a more patient playstyle that revolves around shield pressure and threatening foes with her improved Charge Shot. Overall, Samus is a walking tank among the "all-rounder" characters like her Power Suit would suggest, with high endurance and focusing on hard-hitting punishes and combos both at long range and mid range, but having difficulty dealing with rushdown and disjoints. Together with her Echo Fighter, Dark Samus, Samus' results are developing more rapidly than they did in SSB4, with successes such as ESAM winning The Grind Fridays 60 and reaching 13th place in Glitch 6 while co-maining her and Pikachu, and Vorst placing 17th in Full Bloom 5 exclusively using Samus. YB, a Dark Samus Wi-Fi player from Japan, placed 13th at 2GG: Prime Saga and took sets off of VoiD and WaDi. Samus is therefore considered to be better relative to the cast than in SSB4, but her viability relative to her Melee appearance is very debatable. Samus's model features a more subdued color scheme. Samus has a new air dodge animation. Samus's eighth costume, formerly based on Dark Samus, has been replaced with a black and yellow costume due to Dark Samus's inclusion as a playable fighter. She fires a Super Missile and strikes a pose similar to her official artwork. She lands on the ground and readies her arm cannon. Like all characters, Samus's jumpsquat animation takes 3 frames to complete (down from 4). Samus runs faster (1.504 → 1.654). Samus's initial dash is slightly faster (1.86 → 1.87). Samus has faster horizontal air speed (1.03 → 1.103). Samus reaches the maximum height of her jumps more quickly. Samus has a slightly faster falling speed (1.3 → 1.33). Samus's fast falling speed is faster (2.08 → 2.168). This improves her air mobility and makes her less susceptible to juggles. Forward roll has less ending lag (FAF 40 → 35). Forward roll grants less intangibility (frames 4-23 → 4-19). Back roll has more startup and grants less intangibility (frames 4-23 → 5-20). Air dodge has significantly more ending lag (FAF 33 → 57). Samus's stunned animation no longer has her shake erratically, as if her suit was malfunctioning. The first hit has reduced knockback to keep opponents closer to Samus's, akin to other neutral attacks. However, unlike the case with other characters, this is a nerf for Samus as it further worsens the first hit's ability to true combo into the second hit, while also hindering its jab cancel setups at higher percents. The first hit transitions slower into the second hit (frame 13 → 15). Forward tilt has three different hitboxes instead of four, no longer possessing a sourspot that deals 7% (8% if angled). This makes its damage output more consistent. The sourspot deals more knockback, increasing its safety on hit and KO potential. The removal of teching for grounded meteor smashes drastically improves up tilt's combo potential. Down tilt deals noticeably more knockback, KOing middleweights under 160%, compared to being unable to KO under 200% in Smash 4. This change helps brings it closer back to its power level in Brawl. It has more ending lag (FAF 40 → 45). Dash attack has increased knockback, with its clean hit now being able to KO middleweights at around 150% from the center of Final Destination. It has more ending lag (FAF 34 → 42), removing its combo potential. It launches at a more horizontal angle, which hinders its combo and juggling potential, but further assists in its KO ability near edges. Dash attack produces a visual effect similar to the Shinespark ability from Super Metroid. Forward smash's sweetspot is slightly larger. Down smash deals noticeably more knockback, with the front hit and back hit KOing at around 200% and 165% (respectively) from the center of Final Destination. It is no longer the weakest smash attack in the game by a considerable margin. Down smash has an altered ending animation, with Samus retaining more momentum from the kick. All aerials aside from up aerial have less landing lag (16 frames → 9 (neutral), 24 frames → 14 (forward), 18 frames → 14 (back), 20 frames → 12 (down)). Neutral aerial's second hit comes out faster (frame 16 → 14). Back aerial has more ending lag (FAF 39 → 42). It has a slightly different animation. Samus faces further behind herself while kicking and curls in her leg afterwards. Up aerial deals five total hits, down from six. The first four hits use the autolink angle for the hitboxes on Samus's feet, allowing them to connect more reliably. The hits after the first are faster (frame 8, 11, 14, 17, 20 → 7, 10, 13, 16). However, the move's total duration remains unchanged, giving it more ending lag and making it harder to combo multiple up aerials. Up aerial has increased landing lag (12 frames → 18). Due to its lower amount of hits, it deals less total damage (11% → 10.9%), despite the second to fourth hits dealing more damage (1% → 1.3%). Up aerial's initial auto-cancel window is shorter (frames 1-4 → 1-2). The removal of teching for grounded meteor smashes improves down aerial's combo potential onstage, compounded further by its reduced landing lag. The late hit deals less damage (11% → 10%), hindering its KO potential. Grab aerial causes the Grapple Beam to retract upon hitting an opponent, hindering its utility in battles with multiple opponents. The tip of the Grapple Beam stays in place instead of following Samus's vertical movement, similar to how it behaved in Melee. Standing grab has less startup (frame 16 → 15). Standing and pivot grab have less ending lag, especially the latter (FAF 70 → 60 (standing), 84 → 63 (pivot)). Dash and pivot grab have more startup (frame 16 → 17 (dash), 17 → 18 (pivot)). It has less startup (frame 3 → 1) and ending lag (FAF 9 → 7), but deals much more hitlag (4 frames → 14), drastically increasing its effective duration. This hinders its damage racking ability, no longer being one of the fastest pummels in the game. All throws deal more damage (forward: 9% → 10%, back: 8% → 10%, up: 9% → 12%, down: 6% → 8%). Forward and back throw's knockback was not compensated, improving their KO potential. Samus's forward, back and up throws are no longer weight-dependent. Forward, back and down throws use the electric effect, much like in Smash 64. Samus has a new up throw: she blasts her opponent upward with her arm cannon. It consists of two hits instead of six, with its damage being redistributed (1% (hits 1-5), 4% (throw) → 5% (hit 1), 7% (throw)). Up throw has increased knockback on top of its higher damage, making it powerful enough to KO middleweights under 190%. It releases opponents faster (frame 28 → 16), making it harder to DI. Opponents are also released closer to Samus. Due to the move's total duration remaining unchanged, its ending lag has been increased. However, its closer release point alongside Samus's faster jumpsquat and jump speed still allow it to start combos against some characters at low percents. Up throw uses the flame effect. Down throw releases opponents one frame slower (frame 20 → 21), but has less ending lag (FAF 42 → 38). Combined with Samus's faster jumpsquat and jump speed, this noticeably improves its combo potential. It has lower base knockback, but higher knockback scaling. This gives it new followup options at low percents, such as a dash attack and dashing up smash, without hindering its combo potential at higher percents due to the aforementioned changes. Charge Shot can be charged in midair. It can also be charge-canceled by jumping or spot dodging. It has less ending lag when not fully charged (FAF 54 → 45). It deals more damage (3%-25% → 5%-28%), with knockback compensated. It can now be B-reversed. Charge-canceling the move incurs 4 frames of lag, rather than being instantaneous. Charge Shot can be fired by pressing the attack button. Both Homing Missiles and Super Missiles deal more damage (5% → 8% (Homing), 10% → 12% (Super)) without compensation on knockback, improving the KO ability of Super Missiles. Both types of Missiles have less ending lag (FAF 57 → 55 (Homing), 59 → 58 (Super)). Super Missiles travel faster and stall initially before flying forward, similar to the Turbo Missile custom move from Smash 4. This allows them to effectively stay out for a longer time, improving their camping potential. Samus can drift horizontally after firing a Missile in midair, and Missiles don't halt her aerial momentum. Missiles have updated designs. When firing a missile, Samus's visor and armor lights flash blue in reference to Samus's palette when Missiles are selected in the original Metroid. Screw Attack has less lag before Samus begins falling. Grounded Screw Attack has less startup (frame 5 → 4), making it more effective out of shield. Due to rage being changed to not affect set knockback, the linking hits of Screw Attack can no longer KO off the top blast line at low percents, removing Samus's early KO setups. Grounded Screw Attack deals up to nine hits instead of eleven, but has increased damage on its first hit (2% → 3%) and last hit (1% → 2%). Bombs explode earlier on contact. When Samus unleashes Zero Laser, the jets on the back of her suit vent flames as exhaust, which deal damage. Created visual glitch where Samus’s tether grab beam would disconnect from her arm when performed in air before landing. Samus possesses a tether attack and grab. 13% (grounded), 12% (aerial) An axe kick, which is identical to Captain Falcon's up tilt. It behaves unusually as it meteor smashes grounded opponents, but launches aerial opponents at a horizontal angle. This allows it to set up combos against the former at a wide range of percents, while still being a reliable edgeguard tool, due to its wide coverage and powerful enough knockback to KO aerial opponents at around 95% at the edge. At high percents, the grounded meteor can also set up KO confirms into a fully charged Charge Shot. However, the move has noticeable startup, due to coming out on frame 15, making it Samus's slowest normal attack on the ground. 12% Kneels and quickly thrusts her Arm Cannon downward to fire a small, fiery blast. It is very fast, due to coming out on frame 6, and deals respectable damage and knockback for a tilt attack, KOing at around 160% off the top blast line. It is useful as a close range anti-pressure option on opponents in front of Samus, or as a punishment option. However, its very high ending lag leaves it easy to punish if shielded of missed. 7% (early), 10% (clean), 6% (late) A shoulder tackle with a white aura around Samus. Deals more damage and knockback near the middle of the attack, KOing opponents at around 150% from the center of Final Destination, and earlier near edges. However, the early and late hits are noticeably weaker, and the move lacks combo potential, especially compared to its previous appearance. 13% (Arm Cannon), 15% (blast) Quickly thrusts her Arm Cannon forward to fire a small, fiery blast. Functions similarly to Mario's forward smash, with the blast being the most powerful part of the move. It is one of the fastest forward smashes in the game, coming out on frame 10, while the blast has enough knockback to KO at around 100% from center stage. However, it is rather weak otherwise, with the Arm Cannon KOing at around 135%. It can be angled like her forward tilt, with the upward angle dealing more damage and knockback, though it can typically miss as a result; conversely, the downward angle can hit ledge hanging opponents, but deals slightly less damage and knockback. Cover Fire 3% (hits 1-4), 6% (hit 5) Fires five fiery blasts in an overhead arcing motion. True to its name, this move works best as an anti-air attack, as its multiple hits give a good amount of aerial protection. Conversely, it is unable to hit grounded opponents unless they are close enough to Samus. It is also her most damaging smash attack, dealing 18% total uncharged. However, due to its hits being spread above Samus, it can fail to fully connect if the opponent is hit from too far. 3% (hit 1), 1.6% (hits 2-4), 5% (hit 5) Fires five fiery blasts in a slow, downward arcing motion. The first four hits drag opponents into the rest of the move using the autolink angle, with the last hit carrying the entire attack's knockback. Samus' main aerial move for both combos and protection. Extremely useful as an edge get-up option or against air dodges due to its multiple hits, and using the move immediately after a short hop can hit opponents with the last hit before Samus lands again. 3% (hit 1), 1.3% (hits 2-5), 4% (hit 5) A diagonal corkscrew flying kick, hitting multiple times. It is her fastest aerial, due to coming out on frame 5. Grounded opponents can be hit by the last hitbox if Samus lands while starting the move in the air, although it is difficult to do so, and risky due to the move's high landing lag. It can be used as a follow-up after a dash attack, grounded up tilt, down aerial, or down throw, all of which can be followed up with another up aerial and/or can be finished off with a Screw Attack. On stages with platforms, it even has potential for a zero-to-death when using a platform to extend the combo. 10% Twirls the opponent overhead, then flings them forward. Although its knockback has been increased, it remains too weak for KOing at realistic percents, unless Samus has rage and is at the edge of the stage. 5% (hit 1), 7% (throw) Puts the opponent above herself and blasts them upward with her Arm Cannon. Samus's most damaging and strongest throw, possessing enough knockback to KO middleweights under 190% from ground level and without rage. At low percents, it can also combo into an up aerial against large characters, as well as Screw Attack against most characters, though the latter will only connect its hits reliably on a few characters. 8% Swings the opponent high above her head, then slams them onto the ground. A reliable combo starter, with its followups including a dash attack, small step forward smash or dashing up smash at low percents, a neutral, back or up aerial up to mid percents, and a forward aerial up to high percents. Missile 8% (Homing), 12% (Super) Fires a Missile, which homes in on the opponent. If the special button is tapped like a smash attack, Samus will instead fire a Super Missile, which stays in place for a short while before traveling in a straight line, and deals more damage and knockback. Both variations deal low knockback, but can be used to break a shield if used in conjunction with a fully charged Charge Shot. Both Missile variations can also be used as set-ups by opening up an opportunity for a grab aerial, or Charge Shot, while the Super variation sets up better for a true combo into a forward jumping Charge Shot at high percentages. The Homing variation is also useful for catching recoveries and forcing air dodges, which can open up punishment opportunities. Bomb 4% (contact), 5% (explosion) Rolls into her Morph Ball form and drops a Bomb, which explodes after a set time. Useful to force an opponent to shield and for edgeguarding, being capable of 2 frame punishes if timed correctly. It can also break shields depending on their health if used along with her up and down tilts or a fully charged Charge Shot. Zero Laser 0.5% (fringe loop), 1.5% (main loop), 2.5% (fringe blast), 5.5% (main blast) Fires a very large, bluish white energy beam. The beam can be angled vertically during the Final Smash. Side Taunt: Faces the screen and shows the insides of her Arm Cannon. Lands on the ground and readies her arm cannon. Fires a Super Missile and strikes a pose similar to her official artwork. A flourished remix of the theme that would play when Samus Aran obtained a new power-up or addition to her Power Suit. It would also play when Samus defeated Ridley or Kraid. The opponents Samus faces are akin to the battles that she has faced throughout the Metroid series. Credits roll after completing Classic Mode. Completing it as Samus has "Ending - Metroid" accompany the credits. On intensity 7.0 and higher, Crazy Hand fights alongside Master Hand, and the track Master Hand / Crazy Hand plays during the battle. Each character can be unlocked by clearing Samus' Classic Mode, or the Classic Mode of any preceding character, if all preceding characters have been unlocked. Once all the above characters are unlocked, clearing Classic Mode with any of them will default to Mario's character unlock tree, starting with Sonic. Samus was among the fighters summoned to the cliffside to fight an army of Master Hands. During the opening cutscene, Samus was present when Galeem unleashed his beams of light. Samus attempted to fight back against the beams by shooting them with her arm cannon, but to no avail. Samus was vaporized and placed under Galeem's imprisonment alongside the rest of the fighters (except for Kirby). In gameplay, Zero Suit Samus has a separate awakening battle from Samus. Samus can be found blocking the path of the bridge once engulfed in light and a location reminiscent of Pac-Maze. Defeating her is necessary to progress through the story, making her an obligatory unlock. Samus is later seen among several other fighters, making their last stand against Galeem and Dharkon. She also shows up in the bad ending where Galeem emerges victorious against Dharkon, witnessing Galeem engulf the world in light. Samus's Fighter Spirit can be obtained by completing Classic Mode. It is also available periodically for purchase in the shop for 500 coins. Unlocking Samus in World of Light allows the player to preview the first spirit below in the Spirit List under the name "???". As a Fighter Spirit, it cannot be used in Spirit Battles and is purely aesthetic. Each Fighter Spirit has an alternate version that replaces them with their artwork in Ultimate. Additionally, Samus makes an appearance in various Primary and Support Spirits. Samus on The Great Cave Offensive. Alongside her Bomb in Onett. Back throwing Mega Man with her Grapple Beam on Find Mii. About to fire a Missile at Mother Brain on Lylat Cruise. Preparing her Charge Shot on Summit. Taunting on Coliseum in her Gravity Suit-inspired costume. Samus getting hit by Bayonetta's forward smash on Spirit Train. Buried by the Inkling's Splat Roller on Figure-8 Circuit. Samus watching an aerial Lucario on Prism Tower. Samus getting launched by Shulk's dash attack on Gaur Plain. Samus's Charge Shot getting reflected by Palutena on Temple. Posing behind her Zero Suited self on Gaur Plain. Struck by Bewear's uppercut on Wuhu Island. Getting launched by Lunala's Moongeist Beam along with Fox and Palutena on Summit. Firing a Missile on Wrecking Crew. With Mario, Donkey Kong, Link, Ice Climbers, Pit, Villager and Inkling on Battlefield. Samus, Palutena, Villager, and Shovel Knight fighting on Find Mii Ω with the Moon about to crash into the stage. Samus is the only one of the original 12 characters from Smash 64 to have an Echo Fighter. Samus is the only starter character in Ultimate to have an Echo Fighter. Samus is the only character to have an Echo Fighter that represents a separate entity in addition to a non-clone fighter representing an alternate form of herself. In her official artwork, Samus's pose matches the image of her alongside Anthony Higgs from Metroid: Other M. This same image was used on the official Other M website with Higgs removed. 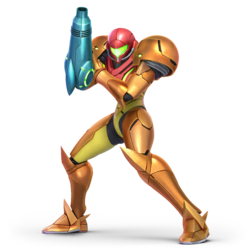 While Samus' playable design has not been updated to the more recent Metroid: Samus Returns, her Fighter Spirit uses her artwork from said game rather than Other M.
This page was last edited on April 21, 2019, at 09:30.